After fighting a few of these battles, I still believe it is worth it. It is obvious that D’Souza will refuse any expert correction. If anything this emboldens his efforts to cast himself as smarter than the academy. D’Souza’s response, while more brazen and rude, is similar to how other historical revisionists respond to public correction. For many years, David Barton was effectively and accurately debunked by Rob Boston, Chris Rodda, and others. However, Barton and his followers dismissed them as unbelievers who attacked him because he was a Christian. When the criticism started coming relentlessly from within the church, things changed. Eventually, Barton’s book on Jefferson was pulled from publication and he was stung by the scrutiny from once friendly sources. Those who follow this blog know that Barton made a come back. He eventually published a second edition of The Jefferson Lies with World Net Daily. Barton, pal Glenn Beck, WND claimed that political correctness at Christian publisher Thomas Nelson doomed The Jefferson Lies. However, the evidence contradicted that claim. Before and after Barton’s book was pulled, numerous Christian historians weighed in against Barton’s writing. Along the way, over 40 Christian historians, some of them quite conservative politically, expressed publicly their criticisms of Barton’s historical claims. It is simply impossible to make a case that the criticism of Barton is based in ideological difference. Has it made a difference? I don’t think there is a good way to know for sure. One can never erase the unprecedented removal of a book from publication. I feel certain Christian history professors are more aware of the issues than ever before. It appears to me that more are speaking out and engaging the public on questions of religious influences during the founding era. I also see fewer instances of false stories such as Congress printed the first English Bible and Jefferson gave his Bible to the Indians as indications that America is a Christian nation. So what has Barton done? With so many academic Christian historians calling him out, he attacked them back by questioning their Christianity and their expertise. He even attacked Christian colleges and universities. He warned parents to think twice before sending students there. He came up with his approved list of schools where the history departments apparently approve of him. Barton shows no signs of stopping his work recruiting legislators to his brand of Christian nationalism. Here is a sign of progress. That list was very small with about 10 schools mentioned. Many were small Bible schools. One, Ecclesia College in Arkansas, became embroiled in a fraud and kickback scandal leading to the jailing of the president. Back to Kruse and D’Souza: Now that Kruse has compiled this list, people who need a quick response to D’Souza defenders have a resource. While an insufficient answer to D’Souza’s overall message, it is a response to D’Souza’s claim that his work is historically sound. 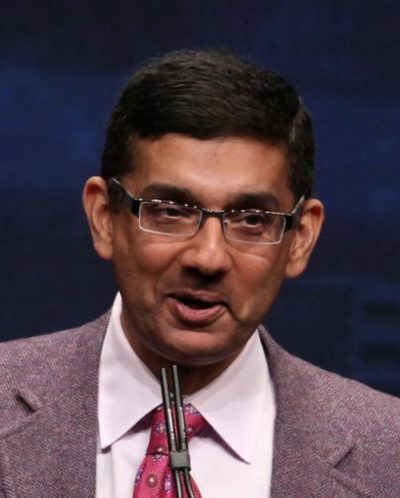 Like Barton, D’Souza may yet find a few professors who are willing to put their reputation on the line to support him. If so, the issues will continue to be exposed to more people which will further discredit D’Souza in the long run. I have watched Kruse and D’Souza for months now and the pattern is that D’Souza makes a claim, Kruse answers, and D’Souza goes silent or responds with an insult. Now that Kruse has confronted several of D’Souza’s claims, this pattern has become clear. That alone has made the effort worth it. Author Warren ThrockmortonPosted on February 28, 2019 February 28, 2019 Categories david bartonTags david Barton, dinesh d'souza, Kevin Kruse118 Comments on Is Confronting Fake History Worth It? David Barton hasn’t gone anywhere but D’Souza is currently associated with the claim that progressive historians have kept the racist past of the Democratic party out of our education system. In 2004, Barton publihed a book called Setting the Record Straight: American History in Black & White in which he emphasized the Democratic failings and the Republican history of civil rights advocacy. However, he fails to account for the shift in the Democratic party during the last 50+ years. Typical of Barton, the book is missing important events such as Barry Goldwater’s failure to support the Civil Rights Act. I critiqued the book in a 2012 post. As a minor point of interest, I believe the pseudo-historian David Barton was pushing the democratic-party-as-the-true-racist-party thing before D'Souza picked it up. I don’t know how long D’Souza has been promoting the Democratic party is still the racist party line but he sounds a lot like Barton when he does it. Is it possible that D’Souza lifted it from Barton? D’Souza claims history teachers obscure the fact that Democrats favored slavery and Jim Crow laws. That certainly isn’t true in our local school system and as Kevin Kruse regularly points out, historians teach the facts — all of them. It is D’Souza and Barton who leave out the facts they don’t like. A few days ago, someone in my mentions suggested I put together a thread of all the *other* historians who've debunked @DineshDSouza on Twitter. Something I’ve noticed about progressives and liberals is how careless they are in throwing false claims around. For instance, I was recently on a national television network where I was introduced as having a doctorate, and progressives instantly ran stories claiming that I don’t have a doctorate. That false claim is amusing on so many levels. First, things like health information and tax information and college educational information are fully protected by privacy laws. So they don’t know whether I have a doctorate or not! And I’ve always chosen not to talk about it. Second, just for the record, I do have an earned doctorate. There it is. And third, not only do I have an earned doctorate, I also have two honorary doctors of letters from other colleges. And according to West Virginia University, the doctor of letters degree is reserved only for individuals who have the highest level of knowledge in their chosen subject matter. Hmmm. So for all of you critics, sorry to pop your balloon, but I do have an earned doctorate. The day after Barton posted this video, I discovered that the degree (partially hidden in the video) was issued by unaccredited Life Christian University, a church which passes itself off as a school. 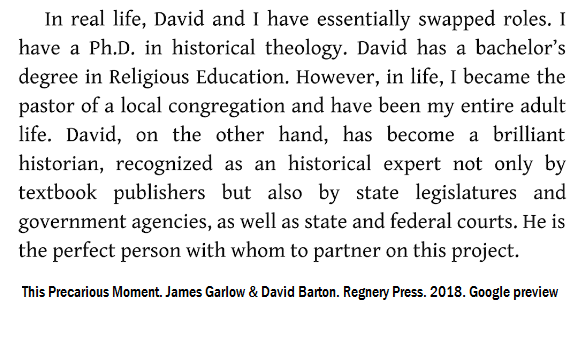 Despite those privacy laws, the president of the entity Douglas Wingate confirmed that Barton was given a doctorate in “Christian history” from the school even though he didn’t attend classes. Wingate calls these degrees earned because Wingate uses published books as a basis for giving a degree. No classes are attended, the degree recipient never enrolls. The federal government considers such practices to be signs of a diploma mill and the state of Missouri will not allow LCU degree recipients to advertise the degrees as earned. Recently, Barton is co-author with James Garlow of a book titled This Precarious Moment. In it, Garlow wrote a chapter where he commented on his and Barton’s education. He makes it clear that he has the earned doctorate and Barton does not. In their new book, Garlow and Barton take on progressives and liberals and offer Christianity as the solution to social problems. However, it is Barton who threw out a false claim about himself and withdrew it the next day without any comment, explanation or apology. Simply put, it was hypocritical for Barton to blast progressives for false claims at same time he was making one. 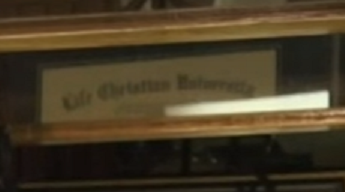 What those crowing about Relotius’ demise aren’t pointing out is that he was fired and his awards taken from him by the same mainstream journalists they criticize. In mainstream journalism, there are consequences for falsifying your public claims and published work. His superiors at Der Spiegel took swift action when it was discovered and CNN removed his awards. What has happened with Mr. Barton after his false credential claim? Nothing. Crickets. Bloggers have written about it but the story didn’t even make Christian news. Of course, Barton had to pay a price for false narratives in the past when his book The Jefferson Lies was removed from publication by Thomas Nelson. However, he has made a comeback among those who should know better, one even telling me that the number of Barton’s followers mattered more than the accuracy of his work. The false education claims (and the NCAA basketball claim, and the Olympic interpreter claim) have come after The Jefferson Lies debacle. One might sense a pattern. 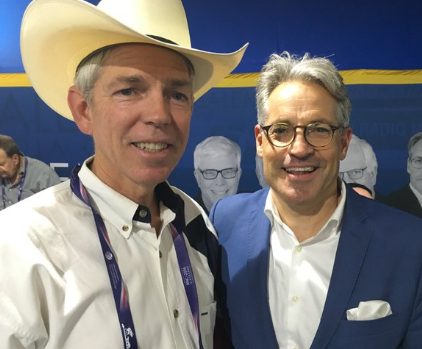 Author Warren ThrockmortonPosted on November 20, 2018 November 21, 2018 Categories david bartonTags david Barton93 Comments on Did Your Tax Dollars Pay for This David Barton Conference? I am slipping. I missed the second year anniversary of David Barton announcing to the world he had an earned doctorate and the second year anniversary of the day he removed any evidence from the Internet that he ever claimed he had an earned doctorate. On September 7 2016, I viewed a video (posted on both his Facebook and You Tube accounts) of Barton claiming he had an earned doctorate he chose not to talk about. Then after I figured out that the degree was from a school that meets the federal definition of a diploma mill and published those findings the next day, he removed the video from his accounts. The following comes from a post marking the one year anniversary of the announcement. The state of Missouri advised fellow LCU degree recipient Joyce Meyer that her claim of an earned PhD from the school was against state law. Meyer’s lawyer responded that Meyer had already decided that describing the LCU PhD as earned was false. Meyer now describes her LCU degree as honorary. Although that description is legal in Missouri, LCU is not accredited by a Department of Education recognized accrediting body and the status as a university is unusual since the school is registered with the IRS as a church. And over two years later, he’s still not talking.